The year is drawing to a close for some. There is always something to celebrate. For those who are fortunate to enjoy good weather, this outdoor activity may be interesting. This is a treasure hunt for outside in the school yard. Thanks to CHARMED ONE, Elizabeth for the template which I used on 2 slides. The clue text slides are editable, so you can adjust them to the objects actually present in YOUR classroom. 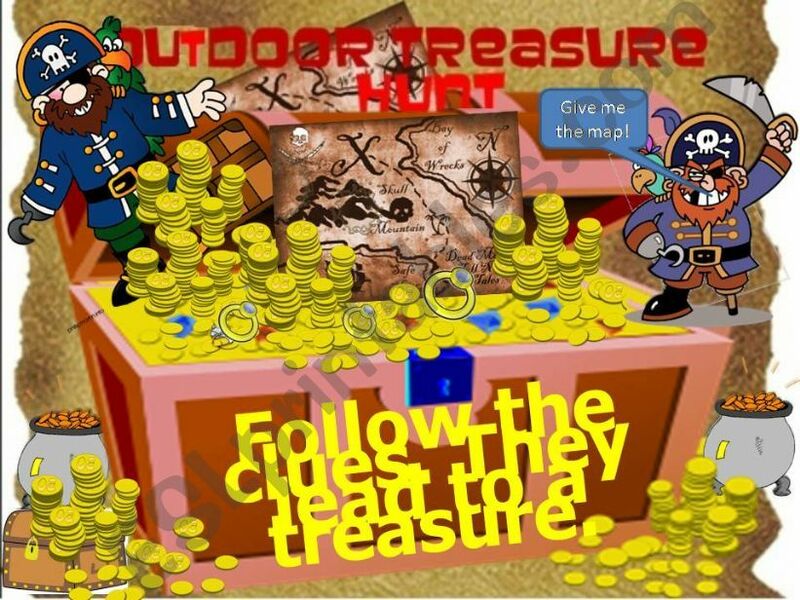 The pictures on the pictorial slides are unfortunately not editable, but I am working on a worksheet with editable images, so you can substitute pictures of what you have in YOUR school yard for the outdoor treasure hunt. Students love following clues to find a special reward. I always made paper maché pinatas filled with candy as the prize.